Individuals, businesses, and organizations use blogs to express themselves and share their ideas, opinions, and news. They are very popular because anyone can blog!. The great thing is that starting your own blog will literally only take you a few minutes. And once everything is set up, you can begin blogging straight away. Pretty cool, right? In this article, we’ll show you how you can create your own WordPress blog in four easy steps. Before we begin, let’s talk about what a blog actually is and why you should be blogging. The word blog is short for weblog which itself is a combination of two words: website and log. So, a blog, in simple words, is a website whose content can be updated frequently and easily. As opposed to a regular website, you can start a blog without any prior coding knowledge – especially if you’re using a content management system (we’ll get to that in a minute). Typically, a blog’s content or blog post consists of text, video, photos, images, and links to other pages. Readers of your blog can leave comments under your blog post to ask you questions and even suggest your next blog topic. This interaction is an important component of a successful blog. Become a Better Writer. Writing a blog will in itself improve your writing. Most people walk around with disorganized thoughts. The act of writing will help you organize your thoughts better. The more you write, the more your writing will improve. Establish Yourself as an Expert in Your Field. Blogs provide individuals an opportunity to highlight their expertise and skills in a particular area and to show off what they know. If your readers find you as an expert in your own niche, they will be willing to reward you for your services. Get More Clients to Your Existing Business. Blogs can help you connect with prospective customers, generate more leads and increase sales. Express Yourself and Help Others. Blogging provides you with an opportunity to flex your creative muscles and express yourself in new ways. You can use your platform to inspire your readers and help guide them in improving their lives. Now that you know what a blog is and the key benefits of blogging, let’s go through everything you need to start a blog. Starting a blog is easy and you don’t need to have any technical knowledge. In fact, all you have to do is follow the steps we’ve outlined below and you will be well on your way to building your first WordPress blog. A domain name (the name of your blog). A web hosting account (where your website is hosted on the Internet). That’s pretty much it. Once you have a domain name and web hosting account, all that’s left to do is configure everything and start blogging. If you don’t already have a niche picked out that you’d like to blog about then continue reading. However, if you already know what your blog is going to be about and can’t wait to set everything up then go ahead and skip down to the next section. The blog format is ideal for expressing your ideas, opinions, and hobbies online. There are a wide variety of blog topics you can select as a niche for your blog – sports, politics, education, gaming, finance, entertainment – the choice is yours. People use blogs to share ideas, news, opinions, and their take on trending topics but that doesn’t mean you can’t use your blog for other purposes. In fact, people use blogs to sell merchandise, raise funds, promote affiliate products – and even travel the world! Select a topic that genuinely excites you. Don’t choose a topic just because it is trendy. Instead, go with one that you know a lot about and are interested in. The more you are passionate about your topic, the more freely your creative juices will flow. If you write about something you love your readers will be able to tell and they’ll appreciate it more. Choose something that you would be interested in learning. Writing and reading are two sides of the same coin. No matter how much authority you have on a subject, learning new things will only add to your strengths. For example, if you select gardening as your niche, you will be spending time and sharing your experiences about plants, seeds, pesticides, and gardening tips and techniques with other like-minded folk. Think about your target audience. Who is your intended audience? How you can appeal to your reader’s interest and get them to keep reading your blog? You want to pick out a niche that you can cover in-depth and easily be able to come up with topics to write about. It’s a good idea to carefully pick out a niche and have a game plan in mind before you begin blogging. Once you have one picked out, all that’s left is to follow the steps outlined below and get your blog up and running. Sign up for a web hosting account. Free blogging platforms don’t allow you to have a custom domain which makes you come across as unprofessional to readers and potential customers. Free blogging platforms can shut your website down at any time without warning. A minor copyright can see your whole blog deleted, along with all your content, with no chance to recover it. Plugins and other customization features offered in free blogging platforms are very limited; so your website looks just like all the other websites on the internet. Even if you start out by using a free blogging platform to later on switch to a paid one, just remember that migrating your free blog can be difficult – especially if you intend on taking a DIY approach. WordPress is the most recommended solution for newbie bloggers as it is user friendly and has great community support. 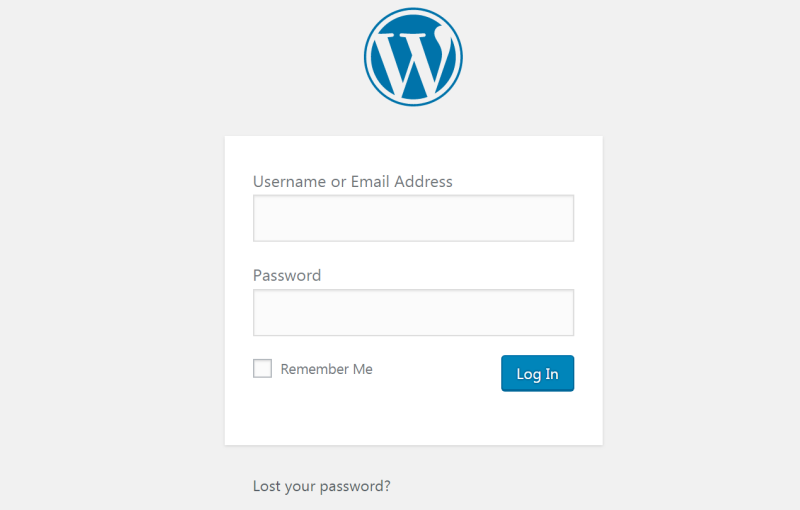 WordPress allows you to access and update your website through an intuitive admin panel. WordPress updates its software regularly to keep your websites secure. Your domain name is the unique address of your website on the internet. It can be anything based on your interests, your niche, your name, or your company’s name. It’s always a good idea to go with the typical .com TLD. However, if that domain isn’t available, you might consider going for a .net TLD or a country (.us, .uk, .ca) or niche specific (.camera, .recipes, .ninja) one. A domain name will cost you an annual fee around $10 to $15 depending on where you get it from. Remember to pick out a domain name that’s (1) memorable and, (2) relatable to your blog’s content. We recommend starting out with SiteGround’s StartUp Plan for your blog since you won’t be getting a lot of traffic to it right away. And when you’re ready to kick things up a notch, you can upgrade to the GrowBig or GoGeek plan. SiteGround’s StartUp plan gives you 10 GB web space and is suitable for 10,000 monthly visitors. In addition to this, it comes with all of the Essential Features including SSD storage, daily backups, email accounts, and 24/7 support. 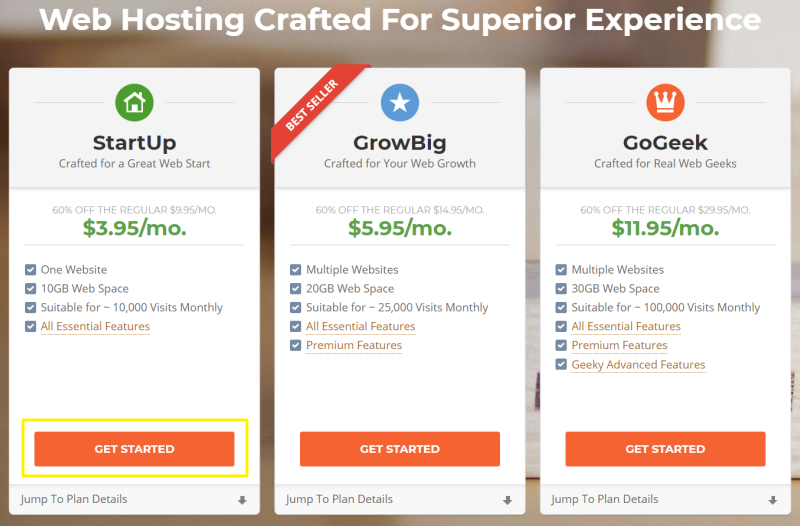 To get started, head over to SiteGround’s Shared Hosting page and click on the StartUp hosting plan’s Get Started button. Next, you’ll have to enter your domain name. If you’ve already purchased a domain name from a registrar then select the I already have a Domain option. However, if you don’t have a domain name and would like to register one through SiteGround then make sure the Register a New Domain option is ticked. 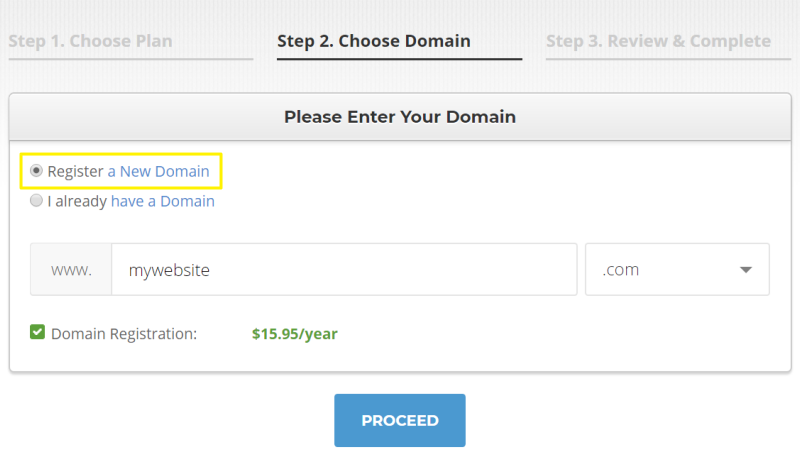 Enter your domain name in the box and click the Proceed button to move on to the next step. In the last step, you’ll be asked to fill out your Account Information, Client Information, Payment Information, and Purchase Information. Once you’ve filled out the form and checked the Terms of Service box at the bottom, click on the Pay Now button to continue. Click on the Proceed to Customer Area button to launch the website setup wizard. 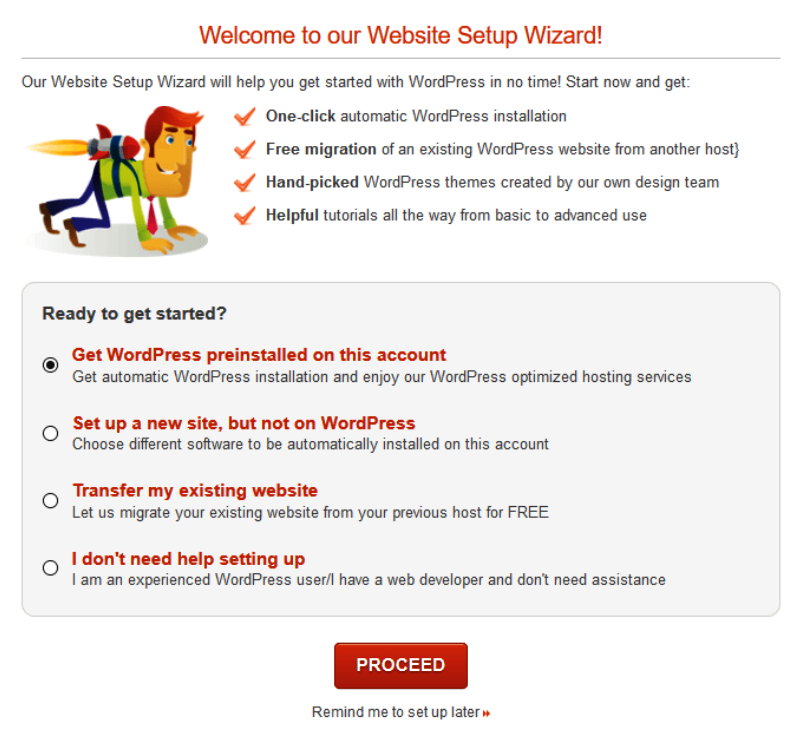 SiteGround’s Website Setup Wizard helps you set up WordPress on your website. Select the Get WordPress preinstalled on this account option and click the Proceed button. The wizard will walk you through the installation process asking you to enter your admin email address and password. These are credentials you’ll be using to log into your website so be sure to jot them down somewhere safe. Once the wizard is complete, you should be able to log in to your brand new WordPress website by heading over to mywebsite.com/wp-admin. All that’s left to do now is pick out a theme and start blogging! Once you know what you want to blog about and have a domain named picked out, setting up your blog is actually pretty simple. And with WordPress as your CMS and SiteGround hosting your website, you’re all set to start blogging straight away without delay! FAQ 1: Is blogging still relevant? Yes, blogging is very relevant in 2018. Every day, an increasing number of individuals, businesses, and organizations leverage this platform to share ideas, news, and their knowledge with their readers. FAQ 2: Can I create a blog without hosting? No, you cannot. Your blog’s files are stored on your web hosting server which is why all websites require some sort of web hosting. FAQ 3: How can I start a blog and remain anonymous? A public-facing website can be anonymously hosted by ensuring that your domain has WHOIS privacy turned on. You should also use a pseudonym and a unique email address, devoid of your name. Needless to say, don’t post any of your photos or videos on your blog.